Cap is a thirteen year-old middle school boy. Rain is Cap's energetic, hippie grandmother. Ms. Donnelly and her teenage daughter Sophie take care of Cap in the "real" world. Hugh Winkleman is a book worm who is Cap's first friend at Claverage. Mr. Kasigi is the strict assistant principal and Zack Powers is the bully. The time period in this book is when the main character Cap is thirteen years old. There are a few places which are Garland where Cap was born and raised, the Donnelly's house where he is staying while Rain is in the hospital, and Claverage Middle School where he went to his eighth grade classes. 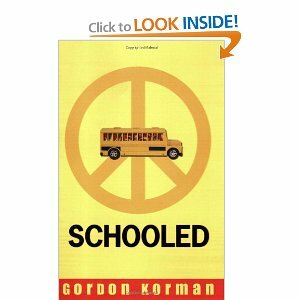 Schooled is about a 13 year old by named Cap Anderson who was born and raised as a hippie on a farm commune called Garland. Cap has to live in the "real" world after his grandmother Rain falls out of a tree. He stays with the Donnellys who have lived in Garland before. Cap was home schooled his whole life, now he has to go to a public school called Claverage Middle School until his grandmother recovers. Since he has never been to the "real" world he has a lot of problems at school. If I was in Cap's situation and I had to leave my grandmother and go to a new school I would make sure I made friends on the first week. I would make friends so they could help me, show me where my classes are, and make me feel better about losing my old friends. I would recommend this book to my cousin Sam because he likes books that has chapters that are written from different characters point of view. I liked the book because it had good stories from each character's point of view of what was happening to Cap in the "real" world.